Until then, why don’t we check out some fun new hat patterns! I start making donation hats around this time every year. My goal is to make 2 – 3 per week until the holidays so that I have plenty of hats on hand. I always donate to local shelters, churches and nursing homes during the cold weather months. I know the power of a good, warm hat, and I am so happy to share my work with others. 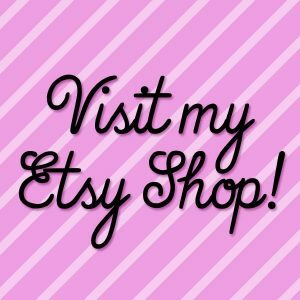 Crochet is a useful skill that is also FUN! Because I get bored if I make the same thing over and over again, I always look for new hat patterns to try while growing my donation pile. It keeps me creatively motivated and also makes each hat unique for whoever will receive it! Here are a few of the patterns I’m going to try out this year.1. 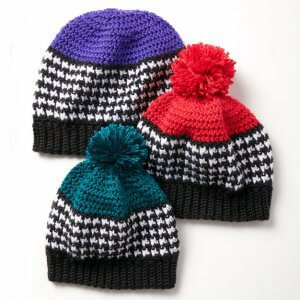 I just LOVE, love, love houndstooth, so I am especially eager to check out this Caron Houndstooth Bright Hat. I love this look! And I like it with AND without the pom poms, so that’s totally your choice. If you want to try basic houndstooth without the stripes, check out this pattern! 2. How about something slouchy? 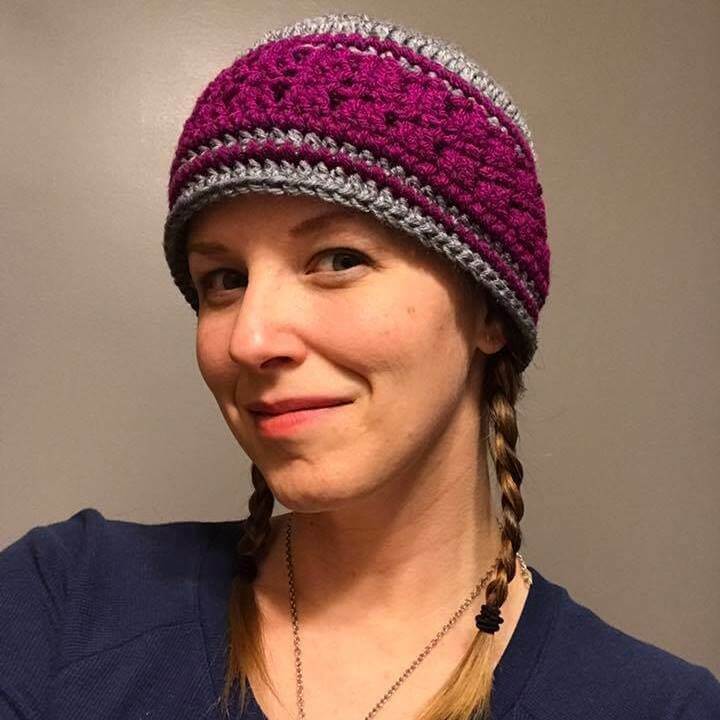 This pattern is one of mine: the Slouchy Side Saddle Hat! It is worked from the brim up to make sure it fits tightly around the head while keeping the looseness up top! I made mine using Caron Cakes yarn in Blueberry Kiwi. 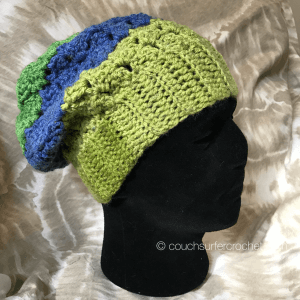 I love using self striping yarn on these slouch-style hats because the color changes don’t seem as obvious as they do in some patterns. 3. 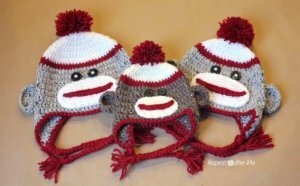 I can’t WAIT to try out this sock monkey hat! I loved sock monkey stuffed animals when I was a kid, and this pattern captures that look perfectly! 4. I have soooo many different shades of yarn. I can’t wait to match up a few of them to try out this Crochet Plaid Slouchy. Pink is my favorite color, so I’m definitely trying this version first, but I can picture this in so many colors!! 5. And another inspiration in pink: the Just Groovin’ Crochet Beanie. Isn’t that detail on the brim amazing?! I can’t wait to try that technique! 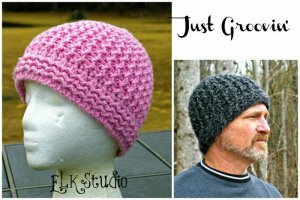 BONUS: If you want to keep it simple, check out my Basic Beanie Pattern. 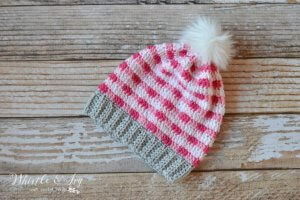 This pattern shows you how to make the easiest beanie you’ve ever made! Once you get the hang of it, you can knock out lots of these in a short period of time! My donation bag always has lots of these, too! I’m working on partnering with a local charity in my area to spread the love farther and wider this year. If you would be interested in helping or adding to our donation pile, email me at amber@couchsurfercrochet.com.